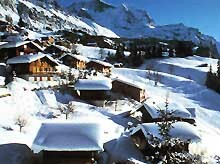 Wengen, which shares the Jungfrau pass with Grindelwald and Murren, is most famous for its dramatic downhill course, the 'Lauberhorn'. 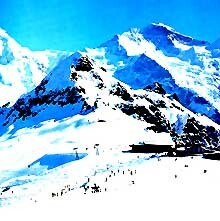 It's also known as one of those classic Swiss ski resorts that is relaxed and has stunning scenery. Don't come here solely to bash as many pistes as possible. Wengen is traffic free and only accessible only by train from Lauterbrunnen. Many skiers will then take the train on up to Kleine Scheidegg, so a good knowledge of the timetable is vital to avoid queues although the newly renovated cable-car to Mannlichen provides a quicker alternative into the main area. As with Grindelwald, the views of the Eiger and the surrounding mountains are awesome. 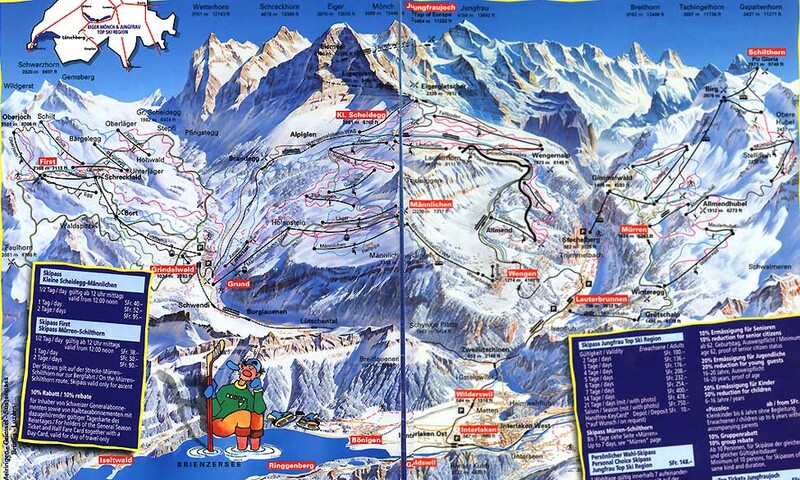 Both resorts share the problem of unreliable snow, as the pistes don't go much higher than 2000m. 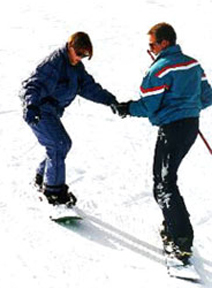 The skiing is very good for intermediates and beginners and the ski schools are excellent. Advanced skiers and boarders don't have too many pistes to try, but off-piste is adequate. 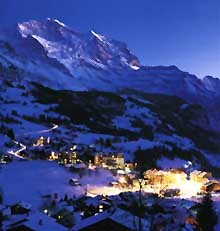 Many people go to Wengen simply for the atmosphere. It's sedate, stress- and traffic-free and 'old-school'. The village has excellent hotels that provide most of the dining, with some superb mountain eateries to boot. Nightlife is fairly restrained but non-skiers have plenty to occupy themselves with. In particular there is the option of the train, providing access to the valley below, to Murren, and to Interlaken. When the weather is fine, many people are happy just to sit out, enjoy the scenery and soak up the ambience of the place. It isn't just skiing in Wengen, you know. Spectacular scenery! Pretty, family-friendly resort centring around the railway. = prices are not yet loaded. Please click on the Hotel name for accommodation information and call us on 0844 371 7733 to check availability. Guests return year after year to this charming family-run hotel, which is popular for its relaxed and friendly atmosphere, and its excellent cuisine. Set on its own terrace, the hotel enjoys wonderful views of the Lauterbrunnen Valley. The Belvedere is a charming hotel with a friendly and relaxed atmosphere, and provides good value accommodation in this classic Swiss resort. The hotel has a traditional décor throughout and has maintained many of its original features. Bernerhof 46 The Bernerhof is a chalet-style hotel offering simple accommodation in a superb central location close to the railway station and beginners lift and is well known for its relaxed atmosphere. With the convenience of ski in/out (weather permitting) this charming hotel has been family-run by the Cova family for over 100 years. The Falken is a wonderful histroic hotel with a home-from-home ambience. Located in the heart of this traffic-free village, just opposite the mountain railway station, the Silberhorn is an ideal base to access the region’s ski area. Offering a good standard of accommodation, cuisine and spa facilities, it has been a favourite with our guests in recent years. Managed by the welcoming Kienzler family, the Sunstar is a popular hotel with good facilities and enjoys a fantastic location, just opposite the lift and nursery slopes. With good facilities and friendly atmosphere, guests here can look forward to an enjoyable stay. Many guests return year after year to this traditionally furnished hotel, which offers a friendly welcome and personal service, and enjoys wonderful panoramic views of the surrounding mountains from its elevated position. A former Art Deco hotel at the heart of an elegant, traditional resort. Silberhorn 134 The Silberhorn is an ideal base for a first-class relaxing break in the centre of Wengen, close to the mountain railway and the Mannlichen cable car. The bedrooms are spacious and well equipped, most with a magnificent view of the Lauterbrunnen Valley. The spa area is a great place to unwind at the end of the day and again boasts fabulous views. Sunstar N/A Located within easy reach of the village centre and Männlichen cable car, Hotel Sunstar has a cosy atmosphere and a daily activity programme for guests that includes guided skiing, tobogganing, wine tasting & guided walks. Wengener Hof N/A In a quiet position just a five minute walk from the village centre and the mountain railway station. The Wengener Hof is owned by the charming Zinnert family and offers a quiet, traditional retreat amid stunning scenery.